On the morning of the 8th, Hummingbird Music issued a statement refuting G.E.M. 's allegation that it made serious breaches of contract, claiming the company has never been involved in any "breach of contract or illegal activities" and has never been "unfair" or "coercive" towards G.E.M. 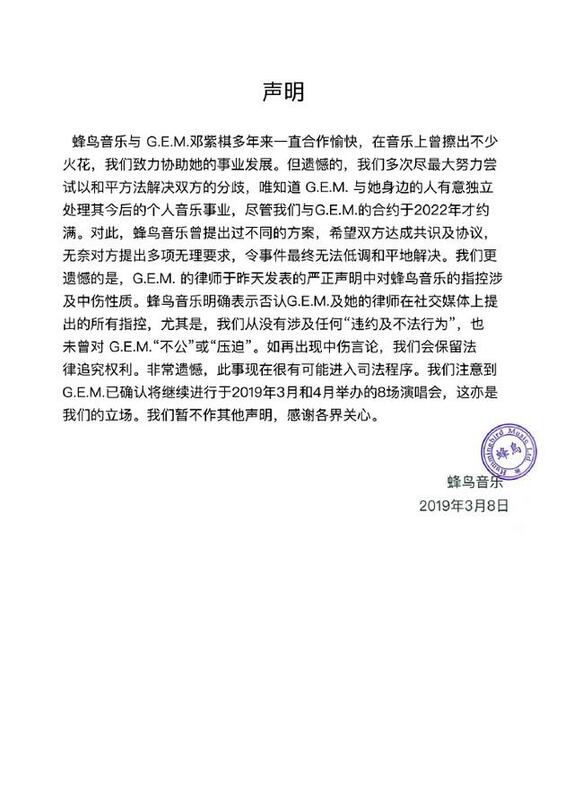 SINA ENT NEWS: On March 7th, G.E.M made a long post announcing that she and Hummingbird Music no longer have a relationship as artist and management. She also expressed that over the years, while being treated unfairly by her former company time and again, she has tried adjusting her mentality and done her best to exercise forbearance, but it has put her through great emotional suffering. On the morning of the 8th, Hummingbird Music issued a statement refuting G.E.M's side's allegations, saying that the company has never been involved in any "breach of contract or illegal activities" and has never been "unfair" or "coercive" towards G.E.M. 1. [+1,500] We have all observed Hummingbird's deeds. In the past few years, there have been many times when everybody [T/N: all the fans] ripped into Hummingbird. No fandom is bored out of their minds with nothing better to do that they will maliciously slander their idol's company. In the WS [T/N: acronym for WeChat business, any mobile e-commerce business that advertises itself primarily through WeChat, but also Weibo etc.] endorsement incident, Hummingbird signed the contract without G.E.M's consent, causing her reputation to be damaged and showing that they have no understanding of how to protect their artist's image. More than that, when Little Deng [T/N: G.E.M] had her rights seriously infringed upon, they didn't even stand up and clarify, never mind pursue the due legal avenues. 2. [+1,100] As a passerby [T/N: non-fan], I feel that there's no need, really. We're all too clear on how Hummingbird is. We choose to believe her not only because we're fans, but more so due to rational judgement [made based on knowledge] accumulated over the years. She has long since paid off her debt of gratitude towards you [Hummingbird] for recognizing her talents and launching her career. It's you guys who owe her something. Let her go. ↪ [+47] Didn't you start writing this as a passerby? And then you say you guys are fans...... Just what are you? 3. [+1,039] Just let it be "merry meet, merry part". G.E.M has been with the company for almost 11 years and has achieved lots of satisfactory results for the company. But the company's attitude is really bitterly disappointing. When the entire Internet was attacking [G.E.M], the company took no actions and even held a party. Completely without Deng's knowledge, they accepted a bad WeChat business's endorsement. They're not willing to promote the company's sole artist. She went on NASA['s stage] and they didn't even arrange a hot search for her. Step by step, G.E.M lowered her bottom limit on what is acceptable, but even so she couldn't gain in exchange any changes on the company's part. Everybody at the company, prepare to live on the streets! ↪ [+3] There's much to look forward to in G.E.M's future. Where G.E.M is, is where her fans will be. Want something related to C-ent translated? Request here. Good luck G.E.M. and wishing her the best.